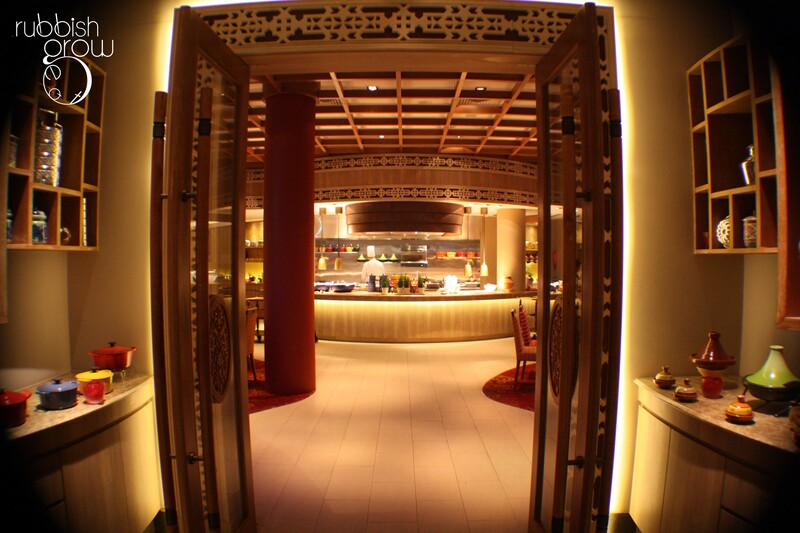 Shangri La’s Rasa Sentosa Resort has a fascinating concept, Dine on 3. There are 3 restaurants in a row: Silver Shell Cafe for buffets; 8 Noodles for affordable Asian fare; and Casserole for casseroles. The place serves Moroccan, Western, Indian and Southeast Asian food and all these different cultures are reflected in the thoughtful decor. It must take a lot of planning to blend the four elements together. As you enter the restaurant, the door beams are carved with an Asian (Indian?) motif that is repeated in the restaurant. The first thing that impresses upon you is the semi-circle open kitchen, a very modern and Western concept. The PR tells us that the chefs hold cooking classes (about $70 per pax)… and then Chiobu hinted very strongly, “I have always wanted to learn to cook Moroccan food.” When a hint falls in a forest and makes such a loud sound that the world can hear, is it still considered a hint? With soft dim lights, the dominant colors are gold and red. Plush red carpet with gold arabesque motif. Red cushy chairs with gold stripes and gold cushy chairs with red stripes. These colors are, of course, both very Indian and very Moroccan. 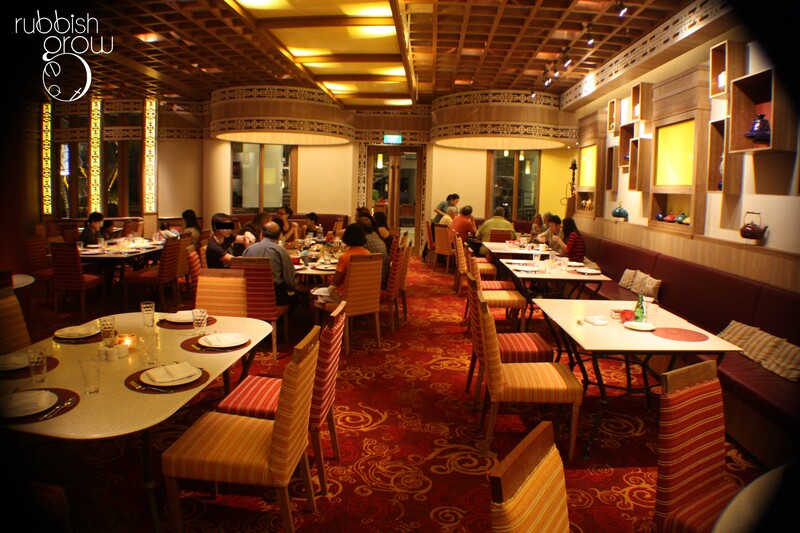 It is a sensual experience in that the decor and the food complement each other. The restaurant serves its food in casserole pots in sharing portions, ideal for family or group of friends, and naturally, casserole pots imply a homely feeling. There is a leisurely atmosphere about the place but make no mistake, the restaurant is serious about food. 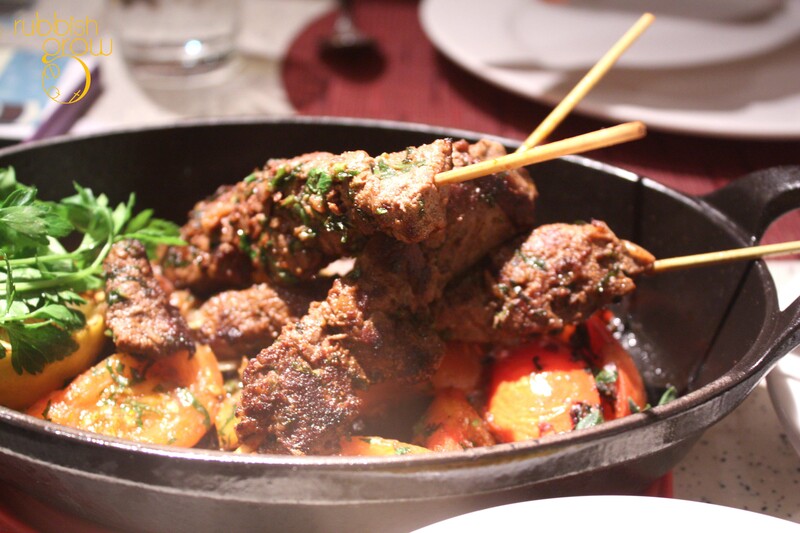 The Moroccan cuisine is helmed by Chef Mansour Ben Ali, a native Moroccan, who cooked for the Guangzhou16th Games. 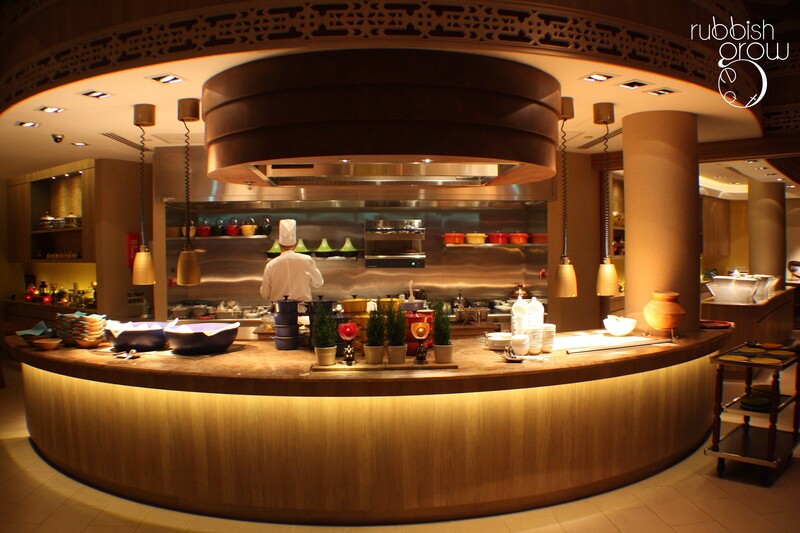 The Southeast Asian Kitchen by Chef Katchen, a native Thai, and the Indian section by Chef Pradeep, a native Indian. 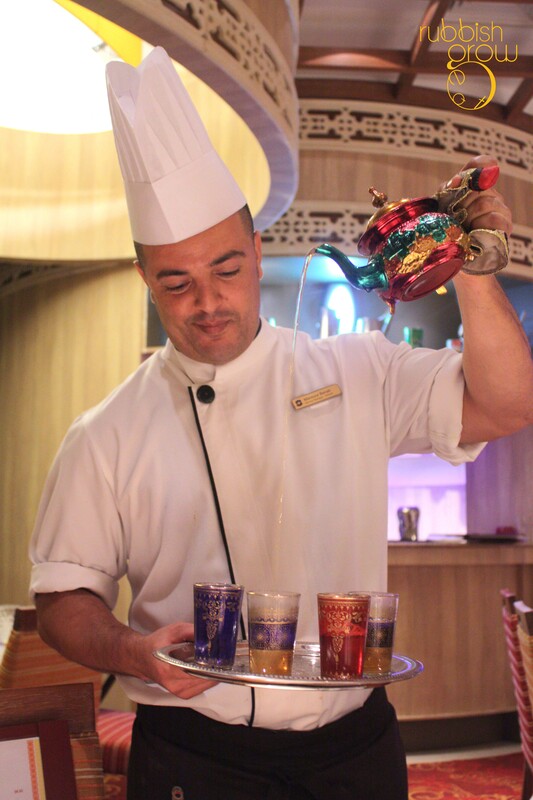 Besides the usual suspects, draft beers, bottled beers, fresh juices, coffees and teas–there is an intriguing tea named Shangri-La, wonder what it is–the other interesting drinks are the cocktails and smoothies, very special concoctions. Cucumber Cooler ($13) has vodka, peach liqueur, apple juice, sprite and cucumber. Blueberry Basil Refresher ($13) consists of gin, blueberry liqueur, lime juice, sugar syrup and basil. Both cocktails sound extremely thirst-quenching and are half the price of many bars. Of the smoothies, $10 each, the special ones are Pineapple-and-mint; strawberry-and-blueberry; and apricot-and-banana. I tried the pineapple-and-mint and was very surprised. I thought it would be mostly pineapple with a hint of mint but in this case, it was a delicate balance of both pineapple and mint. Pineapple can sometimes be astringent, burning the tongue but like Dove’s body wash, the pineapple here had a perfect pH – just a slight sourness without the acid. 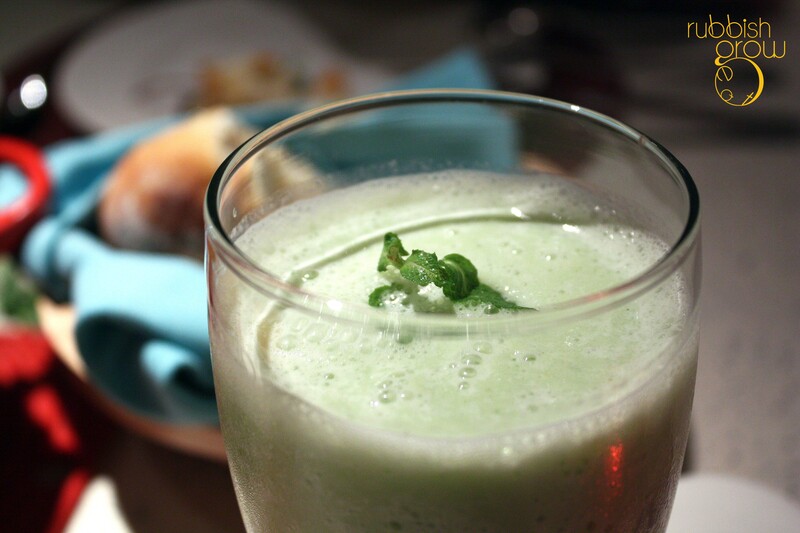 Because the pineapple and mint were in such great balance, they produced a multi-layered taste. I highly recommend it. The food comes with a complimentary salad with greens, carrots, cucumber with balsamic vinaigrette, the preferred dressing for supermodels. What can I say? It’s free. Mai hiam lah. Freshly in-house baked bread, still hot from the oven, is also complimentary. The bread came with in-house self-churned unsalted butter and muhammara dip, a red bell pepper sauce that tasted like tangy, spiced ketchup with an edge. The PR told us to spread both the butter and the muhammara dip at the same time on the bread, producing a pleasant effect. Seafood bouillabaisse ($12) is a French seafood stew that serves two (there were four of us and we got a bowl each). While it wasn’t as thick as we’d like it–the viscosity was more like a soup than a stew–the taste was intense, bursting in the mouth. 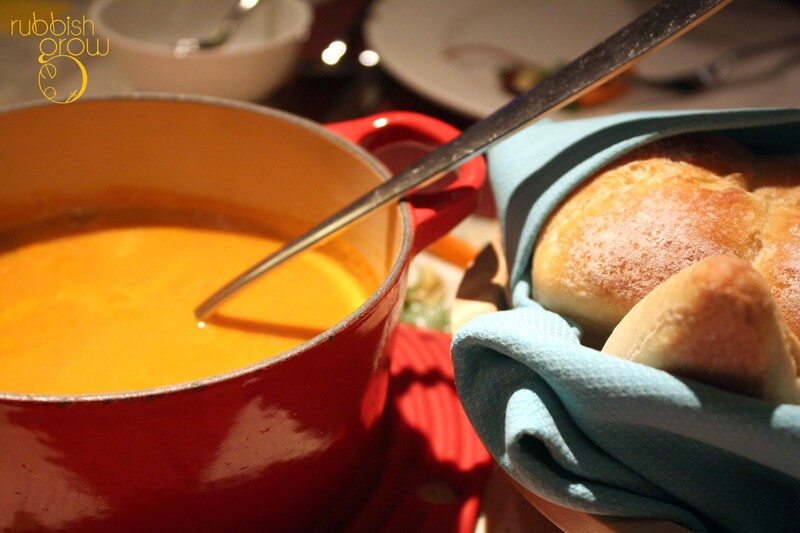 The flavors were similar to lobster bisque but it had additional dimension of sweetness from all that other seafood. We tasted crab meat, scallop and clams. Definitely a must-order. For the mains, each main comes with a carbohydrates. Southeast Asian cuisine comes with jasmine rice; Indian, bismati rice; Western, mashed potato; Moroccan, couscous. Out of the four, we had a hard time deciding if we liked the bismati rice or couscous more. The bismati rice was unique because it not only had raisins but macadamia nuts, giving it a fruity sweetness and a nutty crunchy texture. Disliking couscous in general, this one won me over. It was sweet, topped with pumpkin and caramelized onions, and the couscous didn’t have the barley-like taste, a positive aspect. Couscous should taste like couscous and barley like barley. You can request to change your carb. For example, if you order a Western main and you don’t like mashed potato, you can request to change it to jasmine white rice. It’s up to you, eat as you like. Continuing with the Western section of the menu, the beef bourguignon ($26) uses wagyu beef ramp slow-cooked in red wine sauce for at least 2 hours with garlic, pearl onion and mushrooms. 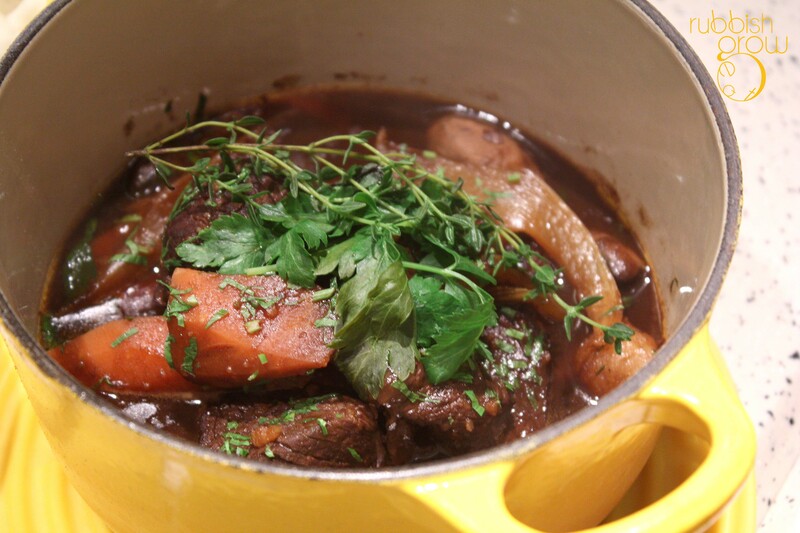 If you’ve been following RERG, you’d know we order beef bourguignon everywhere we go. It was competent. The flavors were lighter than other places and the beef had a bite. 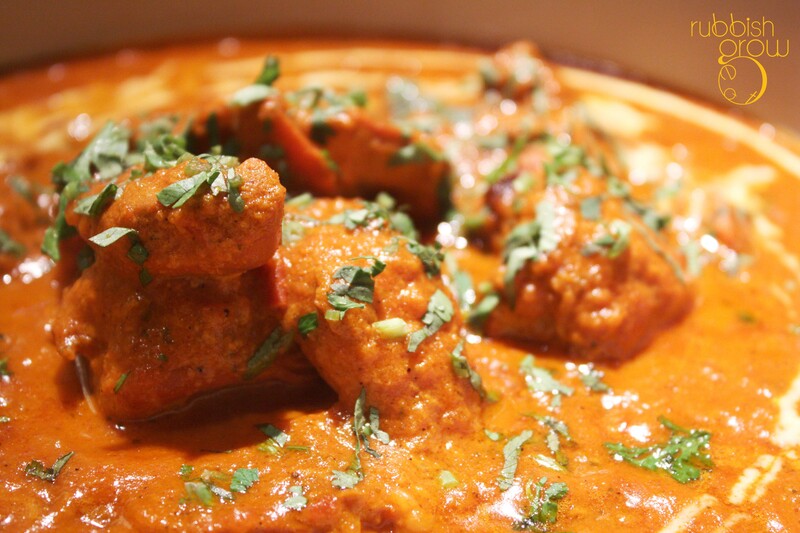 Murg Makhani ($26) is buttered chicken in tomatoes, cashew nut cream and fenugreek leaves. While I found it a tad salty, preferring buttered chicken to be sweet than salty, this was Chiobu’s favorite main. The chicken was extremely tender, melted in the mouth and the sauce was thick and savory. The PR said the angmoh journalists don’t want to eat petai (smelly beans) and asked if we would like it. 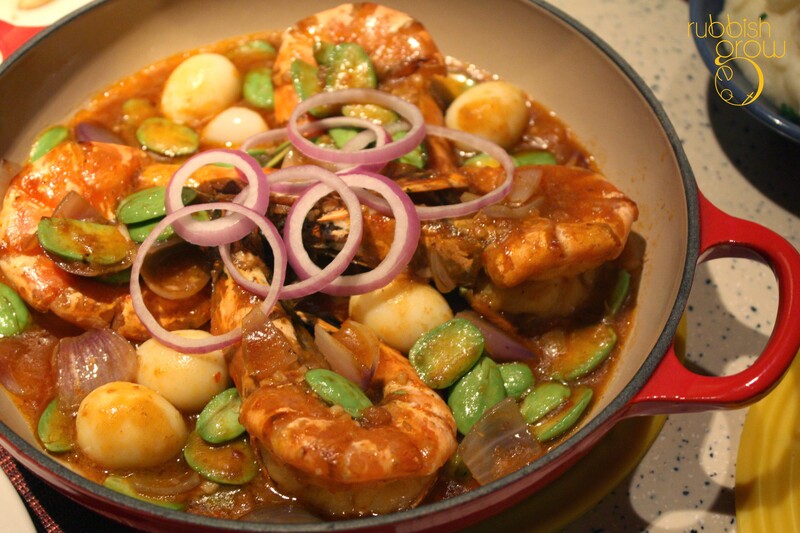 We didn’t mind so we had the sambal prawns with petai ($26) stir-fried with shallots and garlic and quail eggs. The sambal could be spicer. The prawns were huge and fresh. How do you tell if the prawn is fresh? Grandma tells me that the flesh comes off the shell easily and Casserole’s prawns did. Having quail eggs in the dish came as a surprise and we were vying for them. Chiobu said, “Can someone please eat the last quail egg? It’s staring at me, begging for me to eat it.” And before the PRs could respond, I swallowed it. Next time when we return–and we will return because we like the food–I want to try the salt baked chicken ($26) in chinese herbs, wrapped in lotus leaf, baked in rock salt; assam seafood ($26); and Thai green curry ($26) since the chef is Thai. Although lamb tagine ($28), slow-cooked lamb with honey cinnamon, ras el-hanout and saffron sauce, is their speciality, Chef Mansour, like an American Idol contestant, decided to take a risk and recommended us the sheekh kebak ($28), beef skewers marinated with Moroccan herbs and spices, served with Moroccan bread (similar to pita). I’ll pull a Simon Cowell here. I’m sorry, the risk didn’t pay off. Although admirably the lamb was rid of the lamb stench, it was dry and bland. Next time we return, I die die must eat the lamb tagine. Sidetrack: the foreground of the photograph is misty because the steaming hot couscous in front for the dish. Another Moroccan main we sampled was chicken b’stilla ($28), a classic Moroccan dish, their interpretation of a pie with chicken, eggs, almonds, caramelised onions and saffron. Not one to eat sweet dishes for main, Chiobu disliked it. I, however, thought it was quite spectacular. Spectacular because I have never eaten anything like it before. Spectacular because this dish encompasses the history of a culture, a culture that emphasizes on spice and nice sweets. I could imagine this, left to cool on a windowsill, fragrance wafting through the streets of Morocco. The “pie” covering wasn’t so much of a pastry; it was more like the texture of roti prata with cinnamon sugar on top. Saffron gave the minced chicken a honey-like taste. Overall, it’s like a sweet but not oily murtabak. If you seek new experiences and you like sweet things, then I’d highly recommend this. My only problem with the desserts is they were all good I can’t decide which the best was. You can order an entire apple pie ($24), serving 4, or just order a slice ($8). In the photograph, it looked rather frumpy doesn’t it? I actually think it ties in with the restaurant’s concept of casseroles and homely food. This is an apple pie that could have been baked at home. Every slice of apple within the pie was coated entirely with cinnamon. The crust wasn’t those crispy sort; it was doughy and soft in a good way. Altogether, this felt very home-cooked and thus, heart-warming. 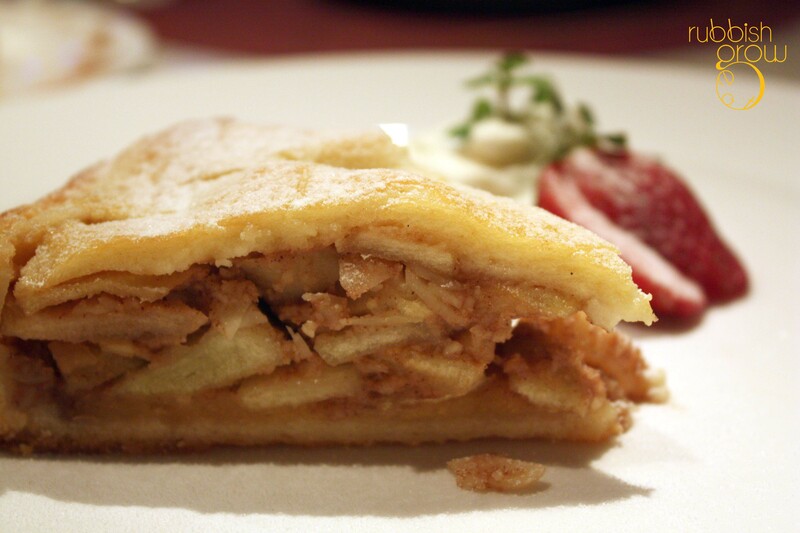 If you like food to arouse an emotion in you, we’d highly recommended the apple pie. Lemongrass brulee ($6) was Chiobu’s favorite. In her words, the bitter, fragrant and gingery lemongrass contrasted with the eggy sweetness of soft custard. The berries–black, blue and rasp–gave it a sourish, fruity taste. 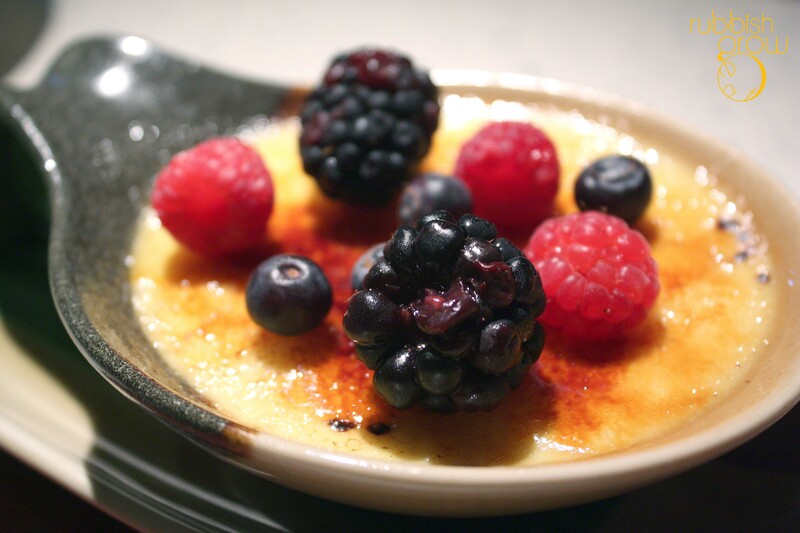 All three ingredients, lemongrass, custard and berries, made the dish work by contrasting and complementing the tastes and textures. If you have sophisticated taste, order this. 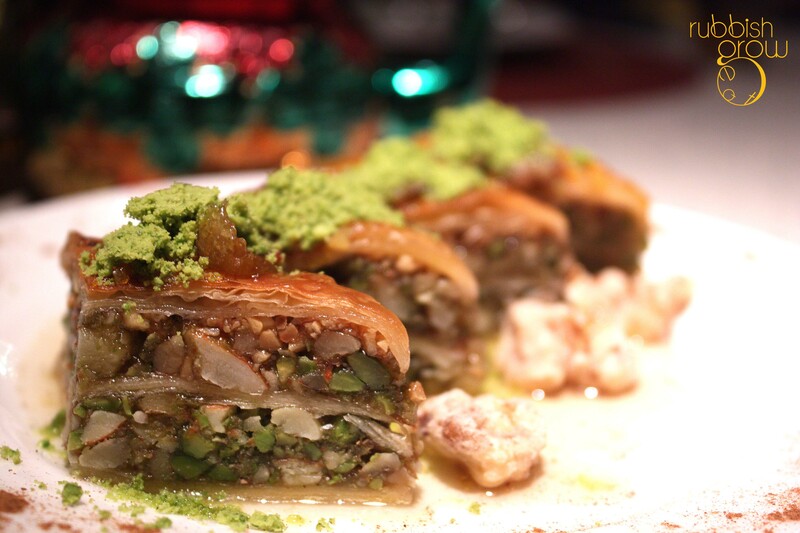 Baklava ($9) is a pastry with nuts and sweetened with honey. The baklava here is definitely different from baklavas we had before. Instead of flakey pastry, the pastry was firm. 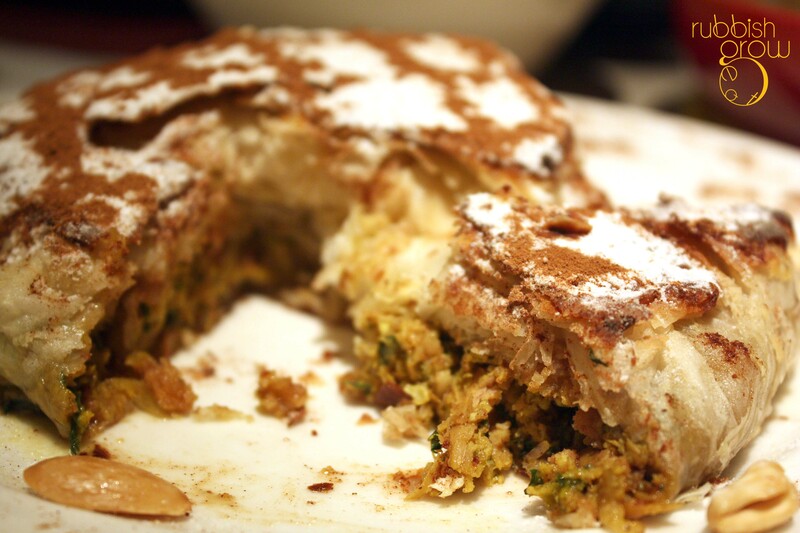 Instead of more pastry to nuts, this one had more nuts (pistachio, almond, walnut) to pastry. Instead of soaking the entire thing in honey, it was lightly drizzled with honey and other spices including lemon zest, clove, star anise, orange peel and finally topped with lovely pistachio. The result is a gorgeous, innovative interpretation of the dessert that tasted like nougat with marmalade. Very crunchy, earthy, fragrant and sweet. 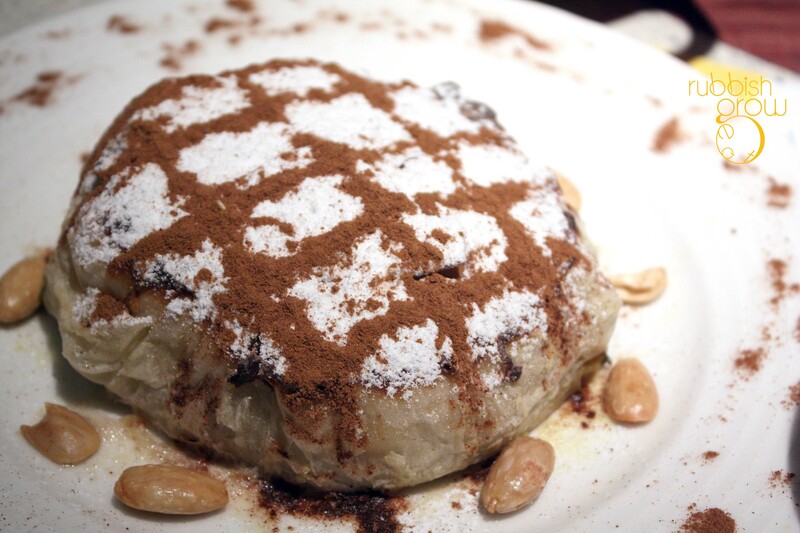 If you like nuts, sweet things and cultural food, this is a clear winner. A special mention of the accompany walnut. Not just your average walnut, it is first dipped in honey then oven-baked to give it a very crispy texture. Simply irresistible. 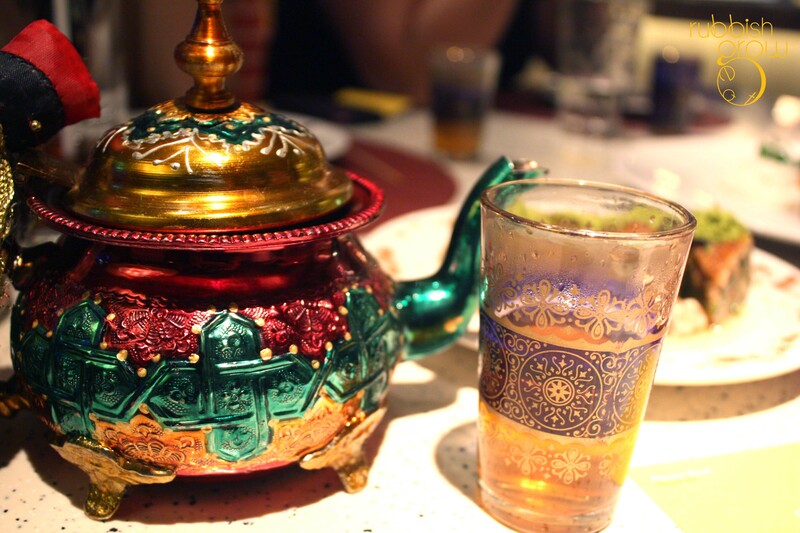 And the best is that the baklava comes with moroccan mint tea. Chef Mansour was extremely kind to serve us himself. Like teh tarik, the purpose of pouring the tea at a height is to aerate the tea, activating the flavors. The mint tea was very invigorating and fragrant. The secret: rose water in the tea. Sidetrack: What lovely teapot and glasses!! Each of them is different. Chef Mansour brought these all the way back from Morocco. Usually for food tastings, the PR will pre-arrange a few dishes but here at Casserole, the PR invited us to order any dish we liked. What this means is that the restaurant is very confident of its food and every dish is a specialty. Chiobu and I agreed that the food was hearty and comforting (like homecooked food) and value-for-money. We estimated that each person only need to spend $30-$40 for such excellent food. Remember, almost everything is made in-house from scratch, from the bread to the sauces. The preserved lemons in jars on the shelf are not only for display, they are actually preserved by the chef for his ingredients! Too many cooks spoil the soup? We certainly don’t think so. PS: We thank Yee Ching and Margaret for hosting us till 10.40pm on a Friday night. 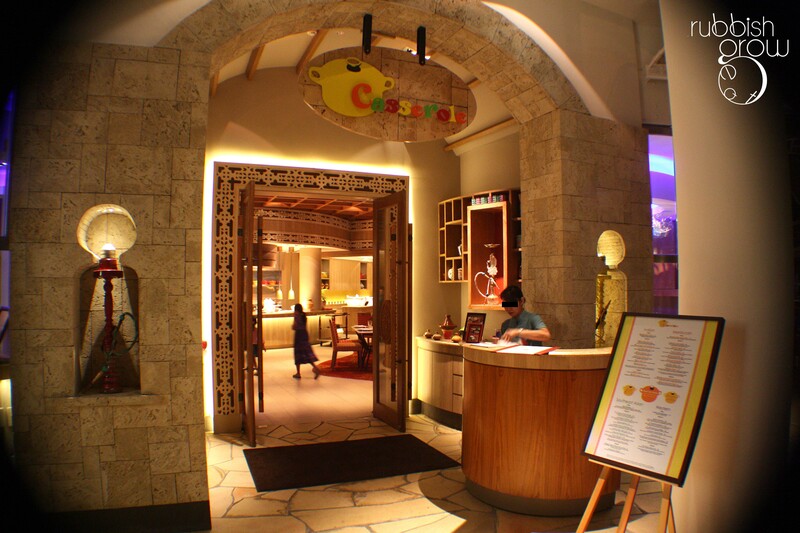 We also thank Shangri La’s Rasa Sentosa and the staff of Casserole for such a delightful meal. We had a wonderful time. Thanks!